For over a century Schwinn has been evolving in their fitness equipment manufacturing and has become one of the greatest innovators of all times, that is why they have remained one of the best in the industry. The Schwinn 170 Upright Bike is no doubt one of their best workout equipment that is also recommendable. This unit has got great features that would appeal to both a beginner and a long time user of fitness equipment. It features 25 levels of resistance that is designed to offer difficult workout experience that would ultimately result in achieving fitness goals quickly. It is also a quiet and smooth operating unit due to its high-speed high inertia perimeter weighted flywheel. The large cushioned and adjustable seat also allows the user to adjust to a preferred position that would offer comfort during a workout which will ultimately result in achieving results. One outstanding feature has to be the Dual Track two LCD window system that allows you to view up to 13 different display feedbacks. The Schwinn Connect also allows you to keep track of your goals and helps you to export data as well. Let’s have an overview of the features and pros. This unit is great at the price it is being sold for when compared with the features available in it. 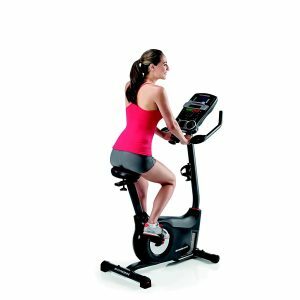 First, the Schwinn 170 Upright Bike is a sturdy and durable indoor bike Its sturdy frame provides a stable workout platform. It has got 10 resistance quick keys that allow you to easily transit from easy to difficult workout on the go. It has got 29 preset workout programs that are designed to help you achieve your fitness goals; 25 out of it support resistance levels. Also, programs for beginners and advanced users are included and 9 out of the preset programs are controlled by heart rate thereby promoting efficient workout experience. The user can download workout data via Bluetooth and USB connectivity to Schwinn ConnectTM and MyFitnessPal. Contact sensors in the had hand grips allow the heart rate to be monitored and also it is chest strap enabled only that the accessory Is not included; has to be purchased separately. It has adjustable forearm rest and handlebars that allow a user get into a comfortable workout position. It has a large contoured thick padded seat with fore and aft adjustability to allow a user find the most suitable and comfortable position. Its DualTrack two blue backlit LCD window system allows you to monitor up to 13 different display feedbacks including heart rate data that would enable a user to maintain target heart rate zone at all times. Speakers and MP3 input port and USB charging are available on the console; which means a user can be entertained during a workout. Water Bottle holder to enable users keeps water handy in order to maintain hydration throughout a workout session. 3-speed fan to keep a user cool and comfy during a workout. For added support, it has 3 piece cranks. Ergonomically placed grip heart rate for a relaxed workout when using heart rate program. It is almost impossible to find a drawback as regards the Schwinn 170 Upright Bike. As at the time of writing this review, there are 468 Amazon consumer reviews and the vast majority of them were satisfied with the unit and recommended it, only very few disapprove because they happen to receive defective equipment. Most times what is responsible for defective equipment is mishandling of the unit during shipping, and usually, when it occurs there would be the need to replace the damaged component and there are inevitable headaches that come with the replacement and repair. This is the major complaints of consumers that reviewed the unit and they are in the minority. You can only imagine how the approval rating is still 4 out of 5 of the 468 reviews, that is to say, the unit is a good buy after all. Shipping cost usually depends on where you are purchasing the unit from; if you are buying from Amazon, they usually ship for free without charges of any sort but that may and not be the case with other retailers. As for assembly, the Schwinn 170 Upright Bike can be assembled by one person because its major components are pre-assembled. Moreover, the instruction manual should be able to guide you through the process of assembly. Only make sure you read it carefully and follow the instructions and you will be able to get your equipment up and working within an hour or so. Only make sure you buy the unit from a reliable supplier so as to avoid the issue of mishandling during delivery. You may also hire an expert to assemble it for you if you do not want to bother yourself with the hassles involved in assembly. Basically, there are a couple of things that make the Schwinn 170 Upright Bike stand out from its contemporaries and one of them is the price. Its current price now is great in exchange for what you will be getting from the unit. It has 25 levels of resistance and sophisticated console powered with features and functions such as the 29 preloaded programs and heart rate telemetry enabled. Moreover, Schwinn is a household name in terms of fitness equipment and as a result, they make sure that quality always accompany their products as you may have seen demonstrated with their generous warranty. One can comfortably say that the Schwinn 170 Upright Bike is a well-equipped unit that will meet all your demands in achieving your fitness goals. The price is also awesome when compared to other upright bikes of its price range. If you need more reviews from real users you may click right here and scroll to the bottom of the page to read some more reviews.